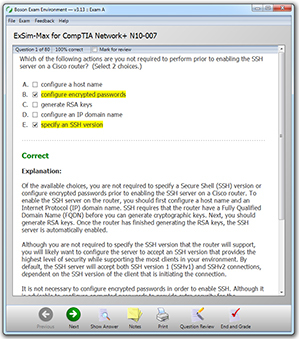 ExSim-Max for CompTIA Network+ N10-007 exam simulation software covers all of the concepts you need to know to pass the N10-007 exam. The CompTIA Network+ exam simulation software includes well-written, technically accurate questions and answers which are divided into three individual practice exams. These practice exams simulate the difficulty and variety of question types on the real exam so closely that, if you can pass our ExSim-Max for CompTIA Network+ N10-007 exam simulations, you will know that you are ready for the real exam - guaranteed. Download the BEE and try the practice exam demo to see how ExSim-Max can help you pass the N10-007 exam. The Network+ (N10-007) exam is required for the the CompTIA Network+ certification. The CompTIA Network+ exam covers network technologies, installation and configuration, media and topologies, management and security. According to CompTIA the candidate's job roles include network administrator, network technician, network installer, help desk technician and IT cable installer. If you get 90% consistently on all the exam version presented in the program you will pass. I passed my second time only because I wanted a baseline but, you could pass the first time if you follow the 90% rule. The questions are similar to the test and they are almost the real deal. I used other practice exams but, the explanation were far superior than the other practice tests I used.